A blind and disabled woman who has waited for nearly two years for bathroom modifications was told to wash at a local gym, her partner says. Judith Mason, 57, has rheumatoid arthritis and diabetes, as well as being incontinent and needing dialysis. 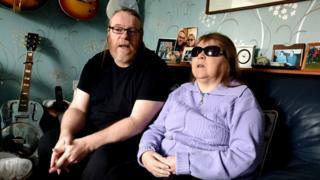 She has been waiting since July 2017 for "reasonable adjustments" to be made to her home in Bootle, Merseyside, her partner and carer Ron Roberts said. Landlords Plus Dane Housing said it "will install an accessible shower". However, it said it would not be safe for Ms Mason to be in the house while work takes place, the Local Democracy Reporting Service said. Mr Roberts said: "We have a full itinerary of hospital appointments, and what little time I have left is spent battling with the council." He said Ms Mason was once sent home from hospital with vomit in her hair but it could not be cleaned because the bathroom is not accessible. "They suggested we go to a local gym to wash her down", he said. "We went once and there was a used verruca plaster in the shower. We went a second time and the same used plaster was in the shower, so we haven't been back." "We aren't asking for the earth, just to be treated with dignity." A Plus Dane spokesman said the firm "has worked with Judith to identify her needs and will install an accessible shower in her home to support her to live more independently". "We have been ready to complete these works but we appreciate that some additional support is required from external agencies," he said. "As soon as this support is in place we will undertake the work." A spokesman for Sefton Council said: "This is an extremely complex case and unfortunately we are unable to discuss individual cases publicly. "We completely understand that carers are under immense amounts of pressure and we will continue to work closely with this family to offer and provide additional support options."